Spectacular firework-like flowers, striking year-round foliage, easy to grow and winter hardy! Ribbon-like, vibrant pink flowers completely smother the plant throughout late spring and summer. Its glorious, rich burgundy, oval shaped leaves contrast superbly against any green plants. Perfect for a pot or border. Avoid very wet, cold spots. Flowers from late winter to early summer. Supplied as an established plant in 5L decorative pot. Height after 5 years approx. 1m (3ft). 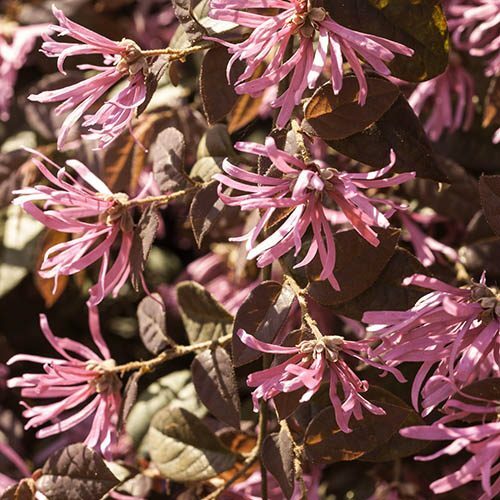 Known as the Chinese Witch Hazel, Firedance Spectacular, Firework-Like Flowers. A plant for all seasons and for all gardens, the Chinese Witch Hazel 'Firedance' really is one of the most spectacular plants you can own! Incredibly exotic looking this highly prized beauty is actually very hardy and easy to grow. 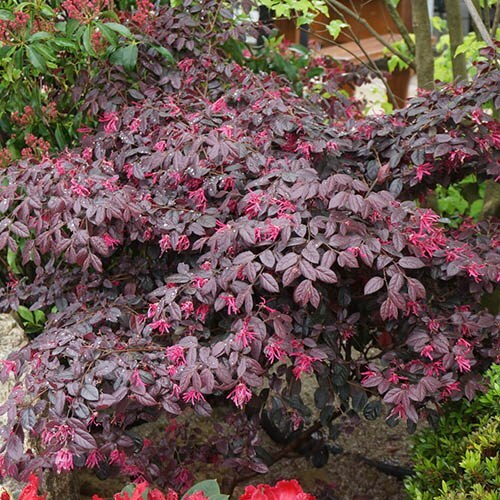 Its glorious, rich burgundy, oval shaped leaves contrast superbly against any green foliage. Often likened to sea coral, the highly unusual ribbon-shaped petals, explode from the centre just like a firework. Supplied as an established plant in a 5L decorative nursery pot, ready for you to plant out. Supplied as an established plant in a 5L decorative nursery pot, ready to plant out. Grows to approx 1m x 1m. 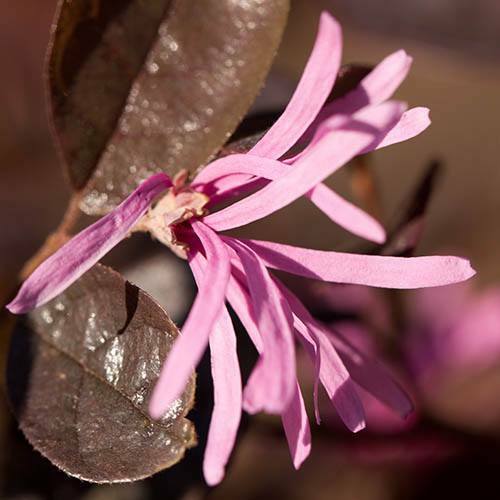 Like clematis, Chinese witch hazel likes to have cool roots, so grow it were the roots are likely to be shades, such as among perennials or cover the area with a thick mulch of gravel. Grow in a sheltered area in sun or light dappled shade. South to south-west facing is ideal. 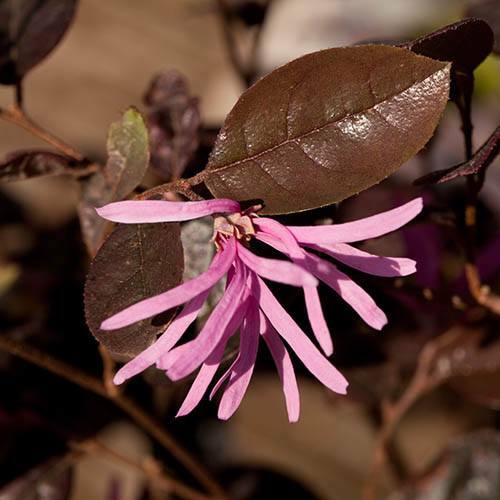 Loropetalum prefers a slightly acidic, humus-rich soil that retains moisture so add ericaceous compost to the planting hole or grow in a container. A tender shrub, young leaves can be damaged by frost, although they will grow back. Provide protection if frost threatens. 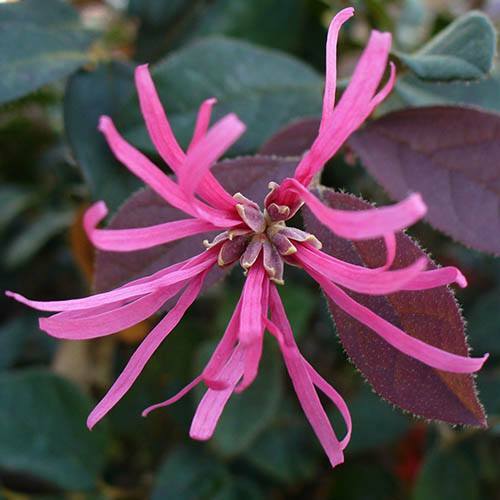 In the colder parts of the country, Loropetalum should be treated as tender and kept in a large terracotta container that can be brought in for the winter.